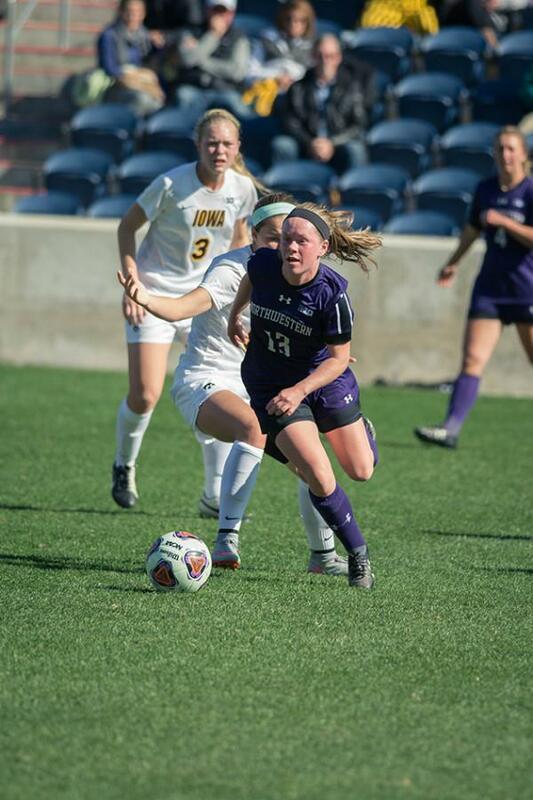 Michelle Manning dribbles upfield during an October game against Iowa. The sophomore forward scored the game-winning goal in double overtime during Saturday's match against Washington State. Three minutes into the second overtime of Northwestern’s first NCAA Tournament game since 1998, Michelle Manning was a bit nervous. But the nerves didn’t stop her, as the sophomore forward snuck behind the Washington State (14-6-0, 7-4-0 Pac-12) defense and slotted home a golden goal to push the Wildcats (14-5-2, 7-3-1 Big Ten) past the Cougars Saturday, 1-0. With the victory, NU advances to face West Virginia in the Round of 32. Coach Michael Moynihan said that the victory felt surreal. Although neither team was able to break through with a goal for more than 100 minutes, both the Cats and the Cougars had ample chances in the fast-paced postseason affair. But both defenses shrugged off the constant pressure to keep the game scoreless through regular time and the first overtime. For NU, the superlative play of freshmen center backs Kayla Sharples and Hannah Davison in their first NCAA tournament action was crucial. Sharples, an All-Big Ten freshman team selection, was everywhere for the Cats, intercepting passes and making critical last-ditch tackles. Meanwhile, Davison was responsible for a headed save off the line that stymied Washington State’s best chance of the first half, a header by Chelsea Harkins off a corner kick. The Cougars were constantly threatening and managed six shots on goal, but the strong play of NU’s freshmen defenders allowed the Cats to keep a clean sheet for the 12th time this season. At the other end, NU’s offense was lively all evening after a punchless showing in a Nov. 1 loss to Michigan that ended the Cats’ Big Ten Tournament run. Junior forward Addie Steiner was a constant nuisance for the Washington State back line, pressuring constantly and running the channels well. Meanwhile, Manning, who has dealt with injuries this season, was strong and smart on the ball throughout the game. She played in Steiner for the NU’s best chance of the second half with a cutting diagonal ball, but Steiner curled the shot just wide of the far post. Moynihan helped his team keep the pressure on with liberal usage of his bench. Nine players saw action for the Cats off the bench, and second half chances by substitutes junior forward Kourtney Scott and sophomore midfielder Kim Jerantowski nearly broke the deadlock in favor of NU. The Cats also seemed to handle being on the road well. Senior midfielder Nandi Mehta said NU didn’t let being away from home impact the team’s play. With neither team able to connect on their chances in regulation and in the first overtime, Manning became the hero after slipping behind the Cougars back line to latch onto a pass from freshman midfielder Marisa Viggiano. Manning took one touch to avoid a defender before passing the ball around the Washington State goalie, ending the game and extending NU’s season. In a nerve-wracking game, Moynihan said he calmed down when he saw Manning get the ball in position to score. Correction: Due to incorrect information from a source, a previous version of this story misstated the number of conference wins and clean sheets Northwestern has this season. The Wildcats have won 7 conference games and have 12 clean sheets on the season. The Daily regrets the error.